Both an MRA and MRI are painless and typically noninvasive diagnostic imaging tools. Doctors may use one of these to view bones, tissues, organs, blood vessels or arteries inside the body. 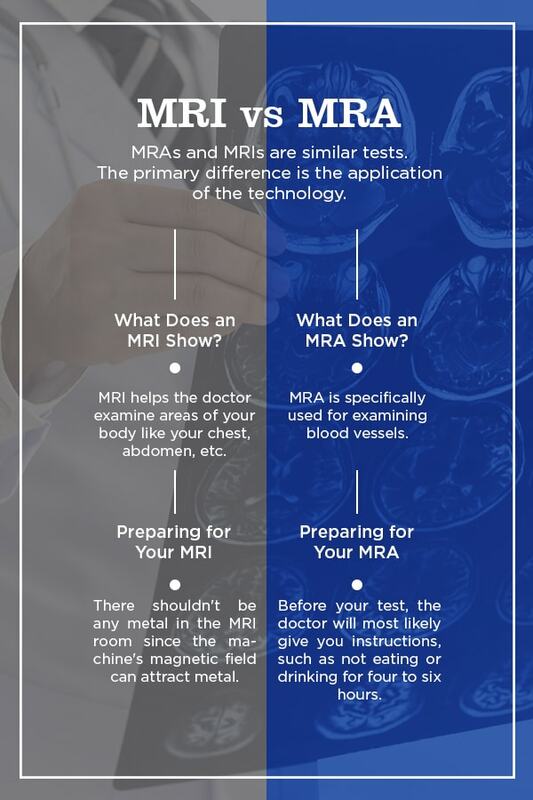 Since they’re so closely related, it can be challenging for patients to understand the difference between MRI and MRA. When you look closer, however, you’ll notice a lot of differences between them despite all the similarities. You can schedule your MRI or MRA here at Health Images, and our board-certified radiologist will read your images. Our technologists are skilled at helping you feel comfortable and relaxed during your MRI or MRA. An MRI stands for magnetic resonance imaging. An MRI uses powerful radio waves, magnets and a computer to create detailed images of the inside of your body. It’s a painless procedure physicians use to view inside your body. MRIs help doctors gather essential information about your spine, joints, brain and other internal organs. They can study your muscles, nerves, bones, ligaments and other tissues using images from this procedure. Doctors study these areas to evaluate the potential presence of injuries. The doctor can use an MRI to provide you with a diagnosis or see if you’re responding well to treatment. Unlike CT scans or x-rays, an MRI doesn’t use radiation. Short wide bore MRI scan: This airy system is five percent wider and 50 percent shorter than traditional MRI setups. MRI scans – high-field (1.5T): Considered as an industry standard, the High-Field 1.5T scanner offers the latest in advanced MRI technology. MRCP scan: This scan focuses on obtaining images of the liver, gallbladder, pancreas, pancreatic duct and bile duct. MRI spectroscopy: This scan can diagnose metabolic disorders, identify the characteristics and aggressiveness of tumors and provide details about chemicals found in your body’s cells. An MRI machine generates a strong magnetic field in your body. The MRI then sends signals to a computer that makes a series of images. Each image will show a thin slice of your body. The computer compiles these slices into a 3-D picture. Before some MRIs, the doctor will inject contrast dye into a vein. The dye helps them view the inside structures of your body more clearly. The dye doctors use often is gadolinium. It may cause you to have a metal taste in your mouth. You lie down on a table. The table slides in and out of the MRI machine. The technologist may use straps to gently hold you during your test to help you keep still. They may have your entire body inside the machine or just a part of it, depending on the type of MRI you’re getting. You may hear loud tapping, thumping, banging or knocking noises during the test. The machine makes these noises when creating the energy to take images. You may ask for headphones to listen to music or earplugs to muffle the noise. You may also feel a twitching sensation during your test, which is the MRI stimulating your body’s nerves. It’s nothing to worry about and is normal. You can talk to your technologist during your test. The MRI testing typically lasts between 20 and 90 minutes, depending on the body area your doctor is requesting. Here at Health Images, an MRI takes about 30 to 60 minutes on average, unless your physician orders your MRI with contrast, which could make your exam last longer. Our MRI scanners are not small restrictive tubes or tunnels, so you have less chance of feeling claustrophobic. If you do begin to feel claustrophobic, tell your technologist, who will do what they can to relieve your anxiety and help you feel comfortable. There shouldn’t be any metal in the MRI room since the machine’s magnetic field can attract metal. Inform your doctor if you possess any metal-based gadgets or devices that could cause problems with the test. These include pacemakers, pacing wires, inner ear implants, cerebral aneurysm clips, TENS units and implanted neurostimulators. You’ll also need to inform them of any tattoos since certain darker inks could contain metal and may affect your MRI. MRA stands for magnetic resonance angiography and is a medical test that helps doctors diagnose medical diseases and conditions of the blood vessels so they can treat them. In MRA, radio frequency waves, a powerful magnetic field and a computer create detailed images of your body’s major arteries. Magnetic resonance angiography doesn’t use ionizing radiation such as in x-rays. Fluoroscopy (x-rays): Helps interventional radiologists place catheters into a person’s blood vessels. Computed tomography (CT): A diagnostic imaging test technologists use to create detailed images of internal bones, organs, blood vessels and soft tissue. Magnetic resonance imaging (MRI): The non-invasive imaging technology discussed above that generates detailed 3-D anatomical images without having to use radiation. An MRA test is similar to an MRI. As such, during the MRA, you’ll need to lie as still as possible so the technologist can obtain the best quality images for the radiologist. MRA can be performed with a contrast material or without. If required, the technologist administers the contrast material in a vein of your arm through a small intravenous (IV) catheter. The technologist may or may not inject a contrast dye into your forearm or hand to help improve the images’ quality. Let your technologist know if you’re concerned about allergic reactions to the dye, have kidney disease or had kidney failure. Improper kidney functioning can affect your body’s ability to flush the dye from your system. Like with the MRI, you’ll lie flat on a table that slides in and out of the chamber. Inside the machine, the radio waves and magnetic fields surround your body, creating images. It’s a painless procedure and lasts between 20 and 90 minutes. While the scanner is running, patients can expect a great amount of noise. Because of this, all patients are required to wear hearing protection or headphones with music. The technologist will communicate through an intercom system keeping the patient informed about length of each sequence. The patient is also given a call button in case of an emergency. Here at Health Images, an MRA takes about 30 to 90 minutes on average. Before your test, the doctor will most likely give you instructions, such as not eating or drinking for four to six hours. You might not be able to have an MRA done if you have a metallic device, such as an artificial heart valve or pacemaker, are pregnant or weigh more than 300 pounds. Once it’s time for your test, you’ll change into medical scrubs (top and pants) or a hospital gown and remove all jewelry or metal objects that could interfere with the magnetic field. Let your doctor know if you’re claustrophobic or nervous as they might give you a sedative to help you relax. Let your doctor about any health issues, allergies and recent surgeries or if it’s possible you’re pregnant. Also let your doctor know if you’re wearing an orthopedic implant of some kind. Most pose no risk, but you should inform the technologist, or your doctor may give you a card to present to the technologist that has information about your implant. Take all medications as you normally would, unless the doctor instructs you not to. MRAs and MRIs are similar tests. The primary difference is the application of the technology. Both the MRA and MRI use powerful radio waves and magnets to create the images of your body’s insides, unlike x-rays which create medical images using ionizing radiation. What Does an MRA Show? The primary difference between the two procedures is an MRA is specifically used for examining blood vessels. Without making any incisions, the doctor can see the many complex and tiny blood pathways through your body. Blood is moving too quickly: You could have high blood pressure that may cause a cardiovascular episode. Blood is moving too slowly: You may have a blockage in your body that could cause a heart attack if left untreated. The MRA will allow the doctor to examine your body’s blood pathways between your kidneys, brain and legs. They may use the contrast material to highlight your vessels and potential blockages. The doctor will likely recommend an MRA test if you or a loved one suffers from a stroke, blood clot, heart disease or a similar health condition. In many situations, the MRA provides the doctor with the information they can’t detect in a regular x-ray, ultrasound or CT scan. It’s a noninvasive exam, and the doctor can store the images on the computer or print them on film. The MRI helps the doctor examine areas of your body like your chest, abdomen, internal organs and pelvis. They don’t use a contrast material in every MRI. Also, MRIs tend to have a bigger area for the doctor to examine instead of simply a single vessel or vein. Aneurysms of cerebral vessels: A thin or weak spot on a brain artery that bulges or balloons out and fills up with blood. Multiple sclerosis: A disease where your immune system eats away at your nerves’ protective covering. Disorders of the inner ear and eye: An example is Labyrinthitis, an inflammation or infection of your inner ear that causes loss of balance and dizziness. Stroke: Damage to your brain due to an interruption of its supply of blood. Spinal cord injuries: Spinal cord injuries can result from damage to your ligaments, vertebrae or disks of your spinal column or spinal cord. Tumors: A tumor is an unusual mass and isn’t necessarily cancer. Brain injury from trauma: A jolt or violent blow to your body or head may cause this type of injury. An object that penetrates your brain tissue like a shattered piece of skull or bullet may also cause traumatic brain injury. The functional MRI (fMRI) of the brain is a particular type of MRI. It might help in examining the anatomy of the brain and determine which brain parts are handling essential functions. This can help the doctor identify essential movement and language control areas of the brain in individuals considered for brain surgery. The doctor may also use functional MRI to assess head injury damage or damage from disorders like Alzheimer’s disease. Heart’s chambers: It can assess the function and size. Heart’s walls: It can assess the movement and thickness. Aorta: It can assess any structural problems like dissections or aneurysms. Damage: It can assess the extent of damage that heart disease or heart attacks cause. Blood vessels: It can assess any blockages and inflammation. The doctor might use an MRI to check for abnormalities like tumors of many body organs such as the kidneys, pancreas, spleen, ovaries or liver. They may use an MRI to help them evaluate things like joint of spinal disk abnormalities. Repetitive or traumatic injuries such as torn ligaments or damaged cartilage can cause joint abnormalities. Bone infections can be a sign of a tumor. Soft tissue and bone tumors are rare. Tumors are either malignant or benign. Malignant tumors are likely cancerous and may spread to other body parts, particularly the lungs and other bones. Benign tumors aren’t harmful and won’t spread. Doctors might use MRIs combined with mammography for detecting breast cancer, especially in women with dense breast tissue or those with a higher risk of the disease. Identify abnormalities like aneurysms in the arteries, abdomen and chest or aorta. Identify an arteriovenous malformation or a small aneurysm. Arteriovenous malformations are abnormal communications between blood vessels. These both can be found inside your brain and other areas of your body. Detect neck carotid artery atherosclerotic disease which is a plaque build-up that can limit the flow of blood to your brain and lead to stroke. Detect narrow leg arteries, often in preparation for endovascular surgery or intervention. Guide surgeons and interventional radiologists, helping them make repairs to diseased blood vessels such as implanting a stent or evaluating a stent after implantation. Detect kidney artery disease or visualize the flow of blood to prepare for stent placement or a kidney transplant. Detect artery injury in the chest, neck, extremities and pelvis in patients following trauma. Evaluate arteries feeding at tumors before a surgery or procedure, such as selective internal radiation therapy or chemoembolization. Identify aorta splitting or dissection in the abdomen, chest or its major branches. Show the severity and extent of coronary artery disease effects and plan for surgery, such as stenting or coronary bypass. Examine lung arteries to detect malformations or blood clots. Examine congenital blood vessel abnormalities, particularly arteries in children who have congenital heart disease. Evaluate whether you have a narrowing the blood vessels leading to the lungs, legs, or kidneys. Screen patients for arterial disease, particularly individuals with a family history of arterial disorders or diseases. Doctors can also use an MRA as a CT angiography alternative when the patient shouldn’t use contrast media. When in need of an MRI or MRA, schedule an appointment at Health Images. As a premier medical imaging destination, we offer same day appointments, board-certified radiologists and a professional, compassionate and skilled staff. We have multiple locations for your convenience, including in the Boulder, Castle Rock, Denver and surrounding areas, so contact us today to book your MRI or MRA.